A report from the Center for American Progress reviews the most damaging extreme weather events in the US over the past two years and how climate change is increasing their frequency and severity, as well as why middle- and lower-income Americans are disproportionately harmed by extreme weather. Hurricane Sandy is only the latest in a line of extreme weather events that severely afflicted Americans over the past two years and an overlooked aspect of these disasters is the rate at which they harm middle- and lower-income households in the U.S. Recent extreme weather events include destructive wildfires in Colorado, record-breaking temperatures across the nation, and severe thunderstorms and tornadoes across the Midwest. Scientists predict heat waves, wildfires, hurricanes, and severe storms will become more frequent and/or severe if the industrial carbon pollution responsible for climate change remains unchecked. 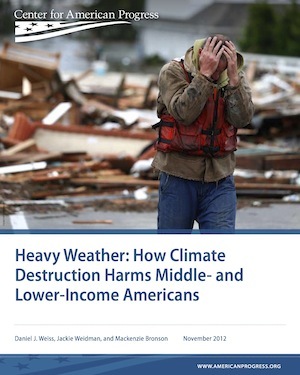 Most of the extreme weather events in 2011 and 2012 harmed counties with household incomes below the U.S. median annual household income of $51,914. The households in the declared disaster areas that experienced five or more billion-dollar extreme weather events earn an average of 7% less than the U.S. median household income. Children, the elderly, the infirm, and lower-income people are much more vulnerable to health impacts from climate change than the rest of the population.